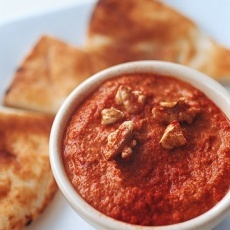 This delectable dip blends roasted red peppers, walnuts, and balsamic vinegar. Paprika and cumin add smoky back notes. The perfect appetizer to bring to a dinner party! For best results, make this dip a day ahead to let the flavors mellow and blend. Serve with toasted pita triangles. Roast peppers over a gas burner until blackened all over, turning with tongs as each side is blistered. (Alternatively, place under a broiler.) Transfer to a bowl, and cover with plastic wrap; let stand about 15 minutes. Peel, and discard skins, stems, and seeds. Set peppers aside. Toast pita bread until crisp and golden. Break into 2-inch pieces; place in a bowl, and cover with the water. Soak until soft, about 10 minutes. Transfer to a sieve, and drain well, pressing out excess water. Set aside. Combine garlic and walnut pieces in the bowl of a food processor; process until fine crumbs form, about 10 seconds. Add paprika, cumin, and reserved peppers and pita bread; process until smooth, about 10 seconds. Add vinegar, lemon juice, oil, and salt, and season with black pepper. Pulse until combined. Transfer to a serving bowl; cover with plastic wrap. Refrigerate at least 1 hour or overnight. Before serving, bring to room temperature. Drizzle with oil; sprinkle with walnuts or paprika, as desired.